Back in July I promised to help track down a solution to the "General failure" error that appears in Outlook when you click a link embedded in an e-mail. Judging from the number of pleas for help I continue to get from readers, this problem hasn't gone away. And it appears to affect users of all browsers, not just Firefox or Internet Explorer. 3. Click Tools (which in later versions of IE is the little gear icon in the upper-right corner), then Internet Options. 4. 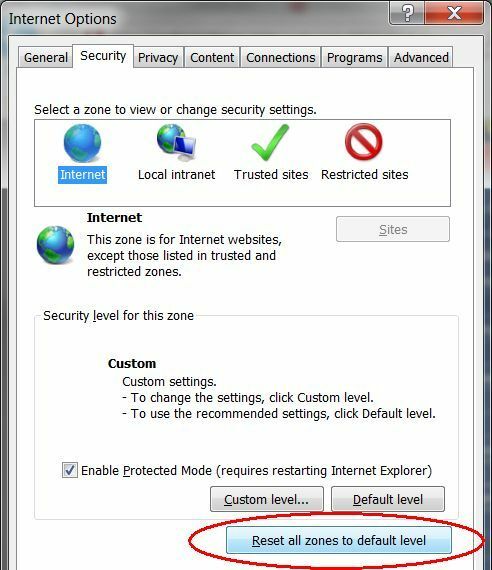 Choose the Security tab, and then click Reset all zones to default level. 6. Restart Outlook, then open any e-mail that has an embedded hyperlink and click it. Well? Did it work? Whether it did or didn't, leave a comment letting me know. And if you're still getting the error, stay tuned--I'm making progress on the Microsoft front.